Me, the mudslide and a new friend. On January 9th, 2018 many lives were changed forever. The small community of Montecito was hit with the worst natural disaster in it's history. A mudslide that killed 21 and as of this post, two children are still missing or unaccounted for. When this event happened we were all shook to our core. How could this happen in such a well established and affluent neighborhood? We had just come out of a three week, other natural disaster, the Thomas fire. This fire burned over 800 homes in Ventura and Ojai and the only reason Montecito did not burn to the ground, was the fact that they had time to prepare as the fire inched it's way 40 miles west, with over 8400 firefighters ready protecting each home from the blaze and unrelenting winds. I was not sure how to process the mudslide. Friends had their homes wiped off the foundation, friends of friends were wiped away and found miles from their homes. People have stories and memories that will haunt them the rest of their lives. Living in Santa Barbara is like living in a slice of paradise. We have a good life here, the beaches, the small town feel, and everyone pretty much knows everyone. So when a small community like ours gets hit with something this unsurmountable how do you deal with it. Many people have taken to the Bucket Brigades, literally meeting at a certain home with boots and buckets and helping their friends and community members dig out what they can from their destroyed homes. I was not sure how I wanted to deal with my sleepless nights, and feeling of helplessness. I did what I know how to do and that is create mosaic art. I have been a professional mosaic artist for almost 20 years, and have had the privilege of creating large scale custom commissions for private residences, medical centers, hospitals, spas and restaurants. So I don't get much time to create my own art, or find a cathartic way to express whatever is happening in my life. 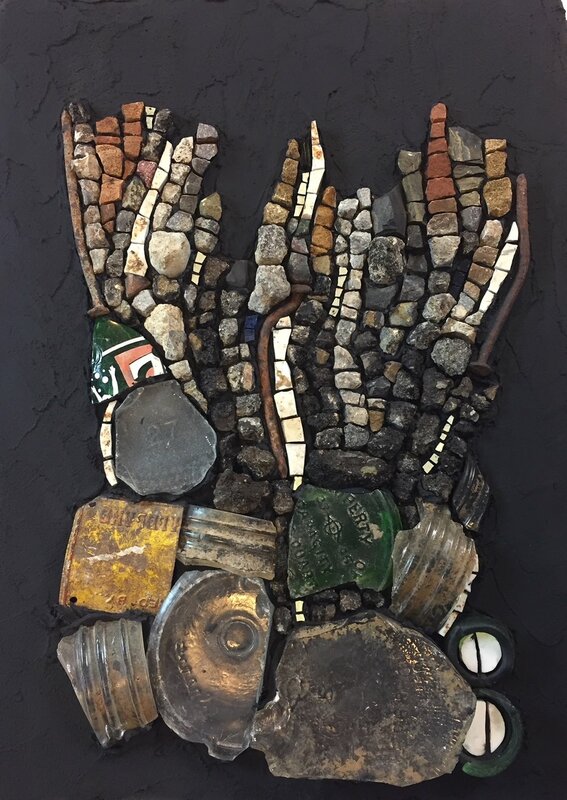 But this time I did, and I created a piece of art using many found objects and debris that are on my property. We happen to live next to a very old and buried landfill. Does not sound glamorous but as an artist it is actually really awesome. This debris is buried only about a foot down and I am constantly collecting old vintage glass jars, bottles and old broken dishes. Not sure how or why, but it works for me and my art. So back to my piece and why I needed to get it out. I was not sleeping most nights after the mudslide, thinking about the victims and what terror they must have gone through, some surviving some not. So I took my found objects and started to create. It felt good to think about these people and what lives they might have had if they had continued to live. I took 23 pieces of gold smalti and added them as a symbol of the bright light that can continue to still shine for those that did not survive. As I was creating this piece and it was becoming more intense in my desire to tell the story and to memorialize these victims, I was also committed to create a mosaic for a conference I was about to attend. At this conference you can enter a mosaic art piece for silent auction, that someone then pays you for your art piece. I finished my piece in time to take it to the conference, but I began to have huge waves of emotions realizing I could not sell it. I could not let someone hang my emotions, catharsis and a memorial piece on their wall. It had to come back home with me. I intentionally priced the reserve so high I knew it would not sell, and it did not. Now here is where the story get's really crazy and really sad. I came home with my piece and hung it on our dining room wall. I loved seeing it everyday but it also kept reminding me of so many emotions and the event. I knew I needed to let go of so much but I was not sure how. That next week my husband and I attended a benefit dinner for a family that lost four members of their family. At this dinner I heard one of the most heart warming and saddest stories of my life. Our Santa Barbara County fire captain Dave Zaniboni told his story. I will try and tell the shortest version, mostly because it is his story but also because it is long and really sad. Dave arrived on the scene of the mudslide around four am. He was by himself driving his fire capt. SUV. While beginning to survey the damage happening he pulled up on a couple standing at the train tracks looking down on something and they were very upset. When he arrived he saw a small boy laying there and was obviously non responsive. As a fireman and first responder he went into "take care of the situation" mode. He grabbed what he had, a yellow fire shirt wrapped up the little boy and took him to his SUV to wait for the coroner. It was a long time before the coroner arrived and Dave just sat with him, talked to him, just sat with him and cried and cried. He told me has never cried as much as he has since this event in his whole life. Dave continued to tell his story the night of the benefit, with more and more details of how he went to personally tell the little boy's Mom he had found him and that he would do whatever it takes to help her and her only other living relative she has here in Santa Barbara. This story is much longer and much more tragic but what I will leave you with is, Dave's story shook me to the core and I knew all my emotional toll I had bottled up over the weeks since the mudslide came pouring out on him the night of the benefit dinner. He understood and when I explained to him I must give him my art he understood that too. He is a special man and a deep soul that has more heroism in his pinky than I will ever know. I will be forever grateful to Dave Zaniboni and he's kind heart and his understanding of a crazy artist that felt his humanness one night and wanted to share her art with him....thanks Dave. Once again I am sitting at my computer deciding to write about sitting down in my studio and getting to work! Well now is the time! I have a deadline and a commission. A pet portrait of all things. Not my norm but someone close to me asked if I would do a portrait of their dog and how could I say no! I am excited to get out my tools, my substrate and my adhesives! Most of all I am excited to get out my stained glass and start to cut, shape and create a one of a kind mosaic. It has been that long! I don't create mosaic art as a hobby, it is my business. It is just I have managed to own a few other businesses that involve mosaic art. Like Santa Barbara School of Mosaic Art, which is a school that has world renowned mosaic art teachers that travel from around the world to come teach at my school. I own Mosaic Arts Online, a business that has a variety of mosaic art online courses. People can purchase courses and have lifetime access to these courses. It has become a great way to get many teachers in front of a much wider audience. Those that cannot travel to see these teachers in person now have the ability to learn from them in their own space and at their own pace. I also travel to Todos Santos, Mexico to lead mosaic art retreats. These happen a couple times a year and do require some amount of attention and work! So back to the beginning, where it all started, creating mosaic art! It is time to create Jess the dog and get his mosaic art portrait off to his happy owners! It is now time to dive into design, laying out, cutting and adhering! When I set out to start the Santa Barbara School of Mosaic Art I had no idea the swell it would turn into. I am so grateful for all the students that have chosen to come and take workshops here at SBSMA. I am also so grateful to the teachers that come year after year to share their experience and knowledge to new and returning students. Little did I know that this would truly become a full time business. I started with creating mosaic art for fun, a hobby, and that grew into a passion and then that grew into commissions and a real business. Now I teach my passion to others, but that is not it. I take students on week long retreats to Todos Santos, Mexico to have a creative and relaxing experience while learning new forms of mosaic art. I have also started a new business to teach people that cannot get to in person workshops. Online mosaic art courses that are in your own space and at your own pace. It is called Mosaic Arts Online. It is starting to really take off. Teachers are realizing this is the way of the future and really loving the passive income from their online courses. With all this business something has gotten lost. My art. My time to sit and break glass and put it back together while creating specific lines that mean something. I know as an artist I need to sit and do the work of an artist. I have also become a full time business woman but it is also time for me to find my way back to my mosaic art. My goal is to learn to find balance. To stand in tree pose and realize that you have to focus on the dot. Whatever that dot is, it is where the balance is. One broken piece at a time I will find my balance and bring my art back to me! Doesn't everybody love a little upgrade in their life? I know I do! And now I have one in my studio. My studio is now fitted with all proper electricity. No more extension cords, or weird wires hanging down on my head. What a small step in my studio, but what a huge upgrade to me. It makes me so happy to sit back and see all the clean lines and not to have to tolerate mess and disorganization. This leads to wanting to create and teach more in my studio. YAY ME!! One day back in 1996 I was working on a TV show as a costumer and a friend/colleague asked me if I wanted to come over and make mosaics? I said, "sure what are mosaics?" He said, "come over and I will show you." From that day forward I have never looked back and I have never stopped creating mosaic art. I have always said mosaics found me. I have always loved and connected with different forms of art but when I began to break tiles, adhere them to different substrates something clicked. So on that weekend or those first few years, if someone told me you will travel to Europe one day to study this art with some of the greatest mosaic artists out there and make a living doing it, I would have LAUGHED OUT LOUD, LOL!!! But here I am today to share my latest experience. I have just returned from Belgium that included a 5 day course studying with one the most sought after contemporary mosaic artists. He is Dino Maccini and he shifted my direction in mosaics and led me to see my art in a whole new way. Last summer I began to feel the need to shift my art, to begin allow my connection to myself and my art become more apparent. I am very successful at creating mosaic art for clients, that include their desires, dreams and designs. As in artist there is always the internal struggle to create for yourself or create for the client. Which will pay more? Which will bring more exposure? Which will fulfill me more? It was time to start to answer these questions and see where I could go with my own expression, desires and designs. For days I would stare at Dino's work, trying to figure out how he did what he did. Then one day while in my studio one of my beloved visiting artist teachers, Mireille Swinnen, announced that when she returned to Belgium, her home, she would be hosting Dino Maccini in her new mosaic art salon studio. Before anything could stop my mouth the words came out, "SIGN ME UP". Then of course I questioned who did I think I was traveling all the way to Belgium to study mosaics, I can't afford that, or to be away that long. But after allowing those thoughts to start to melt away I saw clearly this is exactly what I am supposed to do. Now a quick side note, my husband is a master home brewer of beer and loves beer like I love mosaics. So what better place to go enjoy beer than Belgium. This trip would be a dream come true for both of us and he was in! We packed our bags and not only did we enjoy beer in Belgium but Jerry, my husband decided maybe he could try his hand at a mosaic workshop. Well let me tell you, being the analytical engineer/chemist he is he hit it out of the park with his work on his piece. Working for the 5 days with Dino was a dream come true. He taught us exactly how he creates his pieces, he gave us tips, techniques and secrets to creating his special style. Now the trick with learning a certain style of any artist is to take that information and make it your own. Not to copy their work but to find the nuggets of knowledge they give you and try it out with your own designs. We have only been home a few days but I am more than ready to sit at my work table, hammer and hardie by my side and begin to explore where I can go with the information I learned while in Belgium from the Italian. Stay tuned for more on this journey!! Dino and I at the end of the course. Jerry's and my work at the end of the course. More practice to finish! Summer here in Santa Barbara is a special time. Life slows down a bit and people seem more relaxed and even more creative. So having a career that is all about being creative it is great to see the studio here brimming with lots of projects and ideas floating around. Also owning a creative business means having to spin lots of different plates. Everything from creating mosaic art to teaching and running a mosaic art online tutorial business that can reach all around the world. It all keeps me very busy but doing what I truly love and sharing my passion with anyone that wants to learn mosaic art. I even get to travel to Belgium in October to learn from mosaic master Dino Maccini. At the end of the day, I am a lucky girl that has worked hard doing what I love building a business I am proud of. I am happy to invite anyone that has a desire to learn mosaic art or would like to commission it in their home or business to get in touch and don't let a another day go by. Cheers and here's to happy creating! Here we are another summer in Santa Barbara upon us! I am also happy to share the latest commissions installed at the Goleta Medical Center Children's Clinic. Each of these mosaics were created with the kids in mind. I wanted to create coloring book style pieces. This way while sitting in a waiting room kids and adults alike could enjoy the colorful and fun under the sea theme. This is my second set of mosaics for a children's hospital or clinic. I enjoy creating for kids even if it means they to go somewhere not too fun. These mosaics were created in record time as well. I had a deadline with so many plates spinning it was a small miracle they arrived on their deadline date. Aside from these two installations I also launched my latest business Mosaic Arts Online, the place for all online mosaic art tutorials. I was a presenter at the Society of Mosaic Artists conference in San Diego and was prepping for my annual Todos Santos Mosaic Art Retreat in Mexico. So to say the least it was a lot to get done in a short period of time but it all happened and it was all a huge success. Now on to the next big thing, I will release three more videos by end of June 2016 and Mosaic Arts Online will continue to grow. Santa Barbara School of Mosaic Art has a whole new slew of workshops and I am working towards a great large commission to start soon. So I will continue to spin the plates and creating my mosaic art......till the next time friends! Cheers! I have been away from my blogging duties lately, as I have been submerged in all things mosaic. Thick in thin set for my latest commission, teaching and hosting visiting artists and my latest endeavor Mosaic Arts Online. Mosaic Arts Online will the source for all online mosaic art tutorials. For students that like to work from home studios and cannot get to workshops around the world, this online source will be best way to achieve this. I am so excited as we are putting the finishing touches on these videos so they are streamline, professional and as close as we can to people experiencing as though they are in person. Stay tuned for more info and some teaser videos. It was a fast and furious pace to get the mermaid, as she was referred to regularly, finished. In 6 weeks the Wedi board she was created on was complete, including bolting her to Hardie Backer board for more stability, then being bolted to custom made stainless steel frames. I loved working on this project, Coming out to my studio everyday felt like a day in the candy shop. I enjoyed watching her hair and all the movement come to life, then her large backend of her tail and then the end of the tail. But none of it felt like the true life was in it till the water. I knew exactly what glass I would use for the water. It is the perfect glass, irrid and turquoise full of movement just by itself. Then once it is cut up and given even more andamento (movement) it really came to life. It was one of the hardest ones to say goodbye too, and I miss her. She is hung in a perfect spot on the walkway to the front door of a wonderfully decorated home in Santa Barbara. I am so lucky to create mosaic art for a living, and to create for a family that appreciates my work and continues to find space in their homes to hang it. I am the LUCKIEST girl in the world! My next commission is underway! After a very successful trip down to Hollander Glass all of the raw materials are assembled. This 7' mermaid is going to be an under-the-sea wonder in shiny iridescent blues and greens. I think the biggest challenge so far is going to be keeping the motion of the ocean flowing through her limbs--it's swim or sink under the waves, after all. Being surrounded by all this beautiful glass really gets the creative process going, and I am so excited to dive into this project. Hello there...I have been away way way too long from this website and sharing my art. I have been busy to say the least, but who isn't these days. I could bore you with all the details about a trip somewhere every month for the last 5 months or I could just share a bunch of quick stories of the places I have been recently. First was NYC and Philadelphia in March to see friends and go to the annual Society of American Mosaic Artists conference. As a new board member to the SAMA organization I had a lot on my plate but it was a blast. To spend almost a week with like minded mosaic artists that make a business out of it, I was in heaven. I assisted the ever famous and amazing Sherri Warner Hunter. Sherri is the best concrete sculptor out there when it comes to light weight concrete sculpting and mosaic art. Next was meeting Isaiah Zagar. What a treat. Isaiah has covered thousands and thousands of square feet of mural space with mosaic art all over Philadelphia. He and his wife Julia have a non-profit called the Philadelphia Magic Garden. It is a very special place and I felt lucky to be able to go there. Next I was off to the Todos Santos Mosaic Art Retreat. This is the second year I have taken a great group of people to Todos Santos to create mosaic art, share the beauty of the town and enjoy and relax in this seaside community...oh and did I mention the amazing food our personal chef created everyday! It was an incredible time and I will be hosting it again in April 2016. And last but not least my latest commission was delivered before I left for Philly to a lovely family in Ventura, CA. The title is "Always a Smile"....the family asked that the face be an almost laughing face. I loved doing the closed eyes and having the mouth open with the tongue. I created this piece on Wedi board with stained glass, dichroic glass and glass beads. It is grouted with epoxy grout. It is such a great feeling to complete a piece. Especially the bigger ones. They stay with me for so long and I do become attached to them, but in the end I am ready for them to go to their permanent home. Being an artist that works primarily in commission based work can have a double edged sword. It is so wonderful to create mosaic art, which I love, but I do it with another parties vision. By doing so I do get to put my creative expression into it but I do not come up with the original concept. I love having the opportunity to work with clients and express their ideas through my passion. Being a mosaic artist and working with stained glass, mexican smalti and other beautiful and creative tesserae is a dream come true for me. Thank you so much for seeing this one come to life from beginning to end. It took about 250 hours and most of it was created outside with the Santa Barbara sun shining on my back and my chickens running around my backyard. Specs on this piece are: 4'x5.5' on Wedi board. Tesserae is stained glass, glass gems, mirror. Epoxy grout with a stainless steel frame. Lion details....whiskers are 3D copper wire. Coming in on the final touches!! This commission has been a blast to work on. I love all the colors and the happy presence it has. I love the background as well and it has been a real inspiration to work with some good friends in getting this piece finished!! I am so grateful I get to make mosaic art for a living. I teach to some incredible students and I get to create for great clients!! I love what I do! Hitting the half way point on a commission is always a great feeling. This piece is unfolding in a fun and colorful way. I am looking forward to starting the sun this week. I think using bright and vibrant colors will really make this piece pop. The substrate is Wedi Board, the tesserae is stained glass and the adhesive is Laticrete, special blend of thin set for glass. Starting this week, I will begin a 22 sq. foot mosaic mural. This mosaic has been commissioned by a local family here in Santa Barbara. The piece will hang at the entrance to their newly remodeled home. It will be whimsical and full of color and personal icons that represent each family member. The materials will be stained glass, dichroic glass, and glass fusions. I am looking forward to bringing this mosaic to life. Progress pictures will be in the following posts so stay tuned. Excited to start the work week!! Isn't great when you can say that statement? I am so blessed to have a job and passion I love. This week will be a very busy one. Santa Barbara School of Mosaic Art, http://santabarbaraschoolofmosaicart.com/schedule/, will host one of the best mosaic artists, Carol Shelkin, http://www.carolshelkinmosaics.com/, for the third time as she teaches her REALISM with stained glass mosaic art. I will also begin to create my latest commission as well as finish a fine art piece for my collection. Stay tuned as more pictures will be posted throughout the process. I am so excited to start my next commission. I love to work big, and this one will be 4'x5.5'. It will be created using stained glass, mirror and glass fusions, some of my favorite materials. It will be for a wonderful family here in Santa Barbara. It will be a very personal piece for this family. I love that I get to create mosaic art for people, incorporating their ideas and dreams while I get to execute my passion of this art using a variety of materials. This piece will be blogged from start to finish so stay tuned for pictures and stories as it unfolds. Teaching mosaics is a passion of mine. Little did I know as I was becoming a mosaic artist I would also one day love to teach it. I enjoy every part of the process, deciding what type of workshops my students would enjoy and benefit from, what materials they would like to work with and what I would like to impart on them so they can continue to grow as mosaic artists. I also have visiting artists come in from all over the world to share their talents. It is all very rewarding. Creating mosaic art and teaching mosaic art here in Santa Barbara is truly a dream come true for me. I feel very lucky to have found my passion and am able to make a business out of it. I know the possibilities are limitless and I look forward to more and more years of creating and teaching mosaics. I am thrilled to show off my new and improved mosaic art website to the world. It has been a long time coming to share my work in a creative and modern space. Please feel free to visit again soon as there will be more articles including how to's, tips and techniques as well as my adventures in my mosaic art world.